Sometimes, we just have that one person in our life who has everything. He can buy what he wants, he has collected everything in his collection, and he doesn't want anything new. For people like me, who is a bit artsy, I'd almost always end up creating something from hand for these kind of friends but sometimes, like this year, I just have no time. What to do then? Well, this is actually where I go and grab my go to gift: the Starbucks mugs and tumblers. Why is that? It's actually pretty simple. Starbucks mugs are always worthy of being gifted and the tumblers can easily be carried around and whipped out to use without feeling embarrassed because the design is really chic. Are they not pretty? Now these designs are from past collections but I just wanted to reiterate how pretty they are which is why I showed it here. 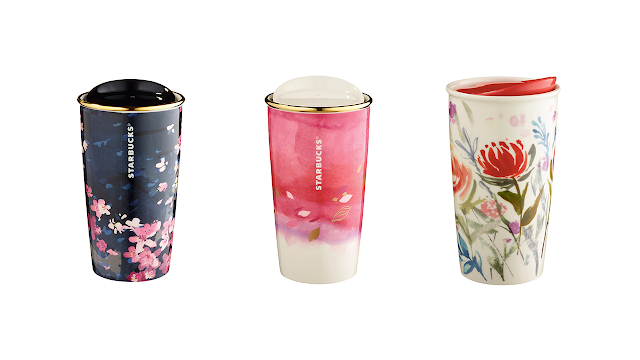 For the latest collection, you can actually head over to your nearest Starbucks store and buy it. It's not pricey and it's quite impressive to hand over one of those brown paperbags with the siren's logo to your boss or friend who has it all. After all, it is Starbucks. Good idea. Every one needs a tumbler or mug at the office or home anyway. And yes, they are indeed stylish. Nowadays, mugs never fail. If there is a term called evergreen in writing/blogging, then I'd say mugs are the 'evergreen' of gift giving. You're right, when a person has everything, then giving a gift is tough. I once wrote about the idea of giving gifts where, as an option, the best gift you could give that cannot be bought, is the gift of your time. It's just an idea. Perhaps an hour in a cafe. These are quite impressive. I am definitely going to check out the nearest Starbucks for these. I love collecting such cute mugs for decor. I love the idea. I'm a huge fan of Star Bucks haha. I also know many people who love the mugs. Unfortunately there's a not a Starbucks near me. But whenever I get the chance, I go there! The tumblers look very classy. Love it.